There are lots of things people claim will change your hair for the better. From the latest superfood to revamp your strands to the newest products you absolutely have to try, there is a lot of hype and noise regarding your locks. With all this fuss added on top of your already stressful day to day life, yoga might be worth a shot for several reasons. You might have heard about the connection between yoga and hair growth. Before you jump on the bandwagon and claim your gorgeous long locks by finding your Zen, let’s take a closer look. There are many claims that doing yoga can make your hair grow. 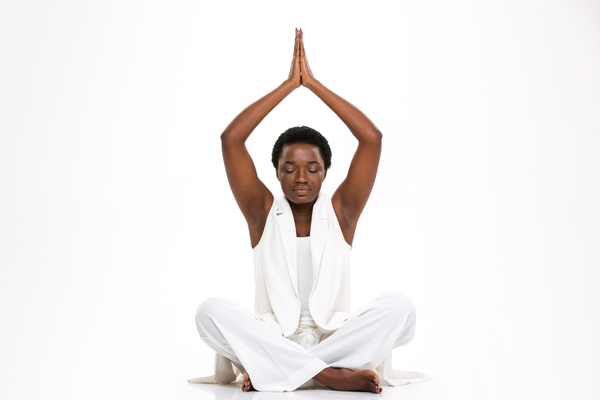 The idea is that yoga is a great way to achieve improved blood flow to the scalp which in turn helps hair to grow. While it is true that increased blood flow helps hair grow, and there are plenty of upside down poses which encourage this blood flow, there is little research involving the role of yoga specifically for hair growth. In other words, while these claims are based in truth, there is little actual research between yoga and hair growth to definitively confirm it. However, there may be a connection between yoga and stress. What does stress have to with your hair? Well, a lot it turns out! Several studies have been performed to discover whether or not yoga has a positive effect on stress. The general consensus seems to be that yoga is a great way to manage stress by means of improving certain functions of the body and helping to regulate hormones. According to a study published in the Journal of Psychiatric Research, “Overall the 25 randomized control studies discussed provide preliminary evidence to suggest that yoga practice leads to better regulation of the sympathetic nervous system and hypothalamic-pituitary-adrenal system, as well as a decrease in depressive and anxious symptoms in a range of populations.” This means yoga is an effective way to cut down on some stress! That’s great, but what does that have to do with your hair? Stress has been a proven detriment to human health for some time now and it is easy to see that connection. When the body is stressed, the adrenal gland releases a hormone called cortisone. While this is intended to be the body’s natural way of reacting to stressful triggers or stimuli, an overabundance can lead to health issues, as well as hair growth issues. In fact, a study published in The American Journal of Pathology concluded that a test group of mice had inhibited hair growth in response to rising stress hormones. This means when your body is stressed, you have a harder time growing your hair. The connection between yoga and hair growth is not a clear-cut path, but it is a generally accepted one when you dive a little deeper into the research. Since yoga is proven to reduce stress, and stress is proven to impede hair growth, the two have a closer relationship than the simplicity of just doing Downward Dog poses for the head rush. So, give yoga a try! Your mind and your hair will thank you.